Given the plethora of tours and exotic destinations, planning an adventure can be both exciting and overwhelming. With so many distractions, the well-being of the people who support these incredible destinations are often overlooked. The consumer’s lack of awareness is a major underlying issue in this struggle for human justice. This next blog series will shed light on the ongoing socio-cultural impacts of the tourism industry as well as solutions that can be taken to prevent being a part of the problem. Reaching the summit of Mt. Kilimanjaro, and inhaling the magnificence of the African safari is undeniably an experience of a lifetime. As you revel in the raw natural landscape, take a moment to ponder the contributing factors that went into making this glorious life changing moment a reality. 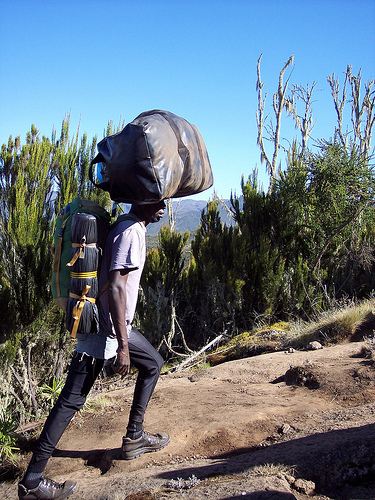 Porters are undoubtedly the backbone behind any mountain expedition. These hard working individuals undertake the daunting task of carrying the enormous load of gear for the entire trekking group. Imagine the difficulty of climbing this challenging peak with as much as 66 lbs on your back? Bearing the burden, is only a portion of the hardships that the porters must face. The harsh environmental conditions and lack of proper equipment present various health implications including: exposure, hypothermia, frost-bite, altitude sickness, and in the worst cases, death. Many tourists misconceive the severity of the situation, by making the assumption that porters are accustomed to such extreme conditions. This premise is far from the truth, according to the International Porter Protection Group porters suffer from more accidents, illness and deaths than Western trekkers. Inadequate clothing, footwear, shelter, nourishment, medical care, insurance, and wages also contribute to the problematic life of the porter. These impoverished individuals are putting their lives at risk, ironically for the sake of survival. This may seem like a contradiction, but sadly it is a very harsh reality. They endure this pain staking labor, so they can provide food and education for their families. Understanding the complexities of the porters’ plight, is crucial in creating consumer awareness and promoting responsible business practices. Despite all of the misfortunes discussed thus far, ethical porter employment, does exist. Responsible tour operators, committed to maintaining fair treatment of their crew, offer comfortable livelihoods for many porters. Unfortunately, the majority of Mt. 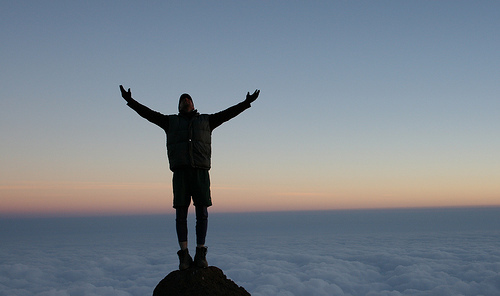 Kilimanjaro tour companies do not adhere to the regulations set by the IPPG. 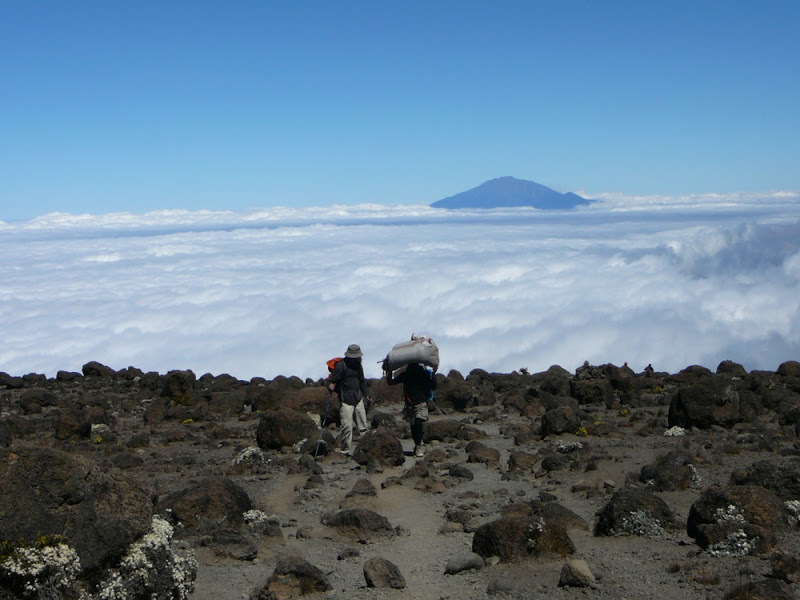 Luckily non-profit organizations and NGOs like the International Mountain Explorers Connection and the Kilimanjaro Porter Assistance Project, have taken the responsibility to monitor these trekking operators and ultimately improve the working conditions for the porters on Mt. Kilimanjaro. In an attempt to promote sustainable tourism they have created a network between mountain climbing enthusiasts and the native people of these sought after destinations. Through IMEC’s Partnership for Responsible Travel Program, travellers are able to access a list of partners that have been recognized for their commitments in ethical porter treatment, environmental conservation, and cultural preservation. Does the company follow IPPG’s 5 guidelines on porter safety? What is their policy on equipment and health care for porters? What do they do to ensure the trekking staff is properly trained to look after porter’s welfare? What is their policy on training and monitoring porter care by its ground operator in the country you intend to visit? Do they ask about treatment of porters in their post trek feedback questionnaire to clients? Global Basecamps and our Tanzania inbound tour operating partner recognize the importance of social responsibility for all global citizens, and are both proud partners of the IMEC. We believe that through providing education and awareness, the demand for regulation and sustainable practices will increase. This shift in priorities, will hopefully pressure the tourism industry to improve their practices, creating a positive impact on these incredible destinations. Ensuring the fair treatment of your porter is ultimately in your hands, by using a responsible tour operator, you will feel invigorated in knowing that your trip to the summit has not only changed your life for the better, but also the lives of the people who got you there! Want to be a part of the solution? Explore Tanzania guilt-free with Global Basecamps...check out a Tanzania Safari or start planning your custom itinerary by filling our our custom trip request form!